26th January is celebrated as Republic Day all over the India. National Flag will be hoisted in all the schools, Colleges, Government Offices on 26th January of every year. we commemorate the freedom fighter on this day. On 26 November 1949, the Constituent Assembly of India adopted the Constitution of India, and it came into effect on 26 January 1950. On account of implementation of indian constitution on this day, the nation will celebrate it as Republic Day. On this day flag hoisting will be done in the schools, colleges, and all Government Offices. We remember all those who given their efforts to get freedom, and also we remember Dr. BR Ambedkar who is writer of the India Constitution. On this day, students will participate in cultural activities programs which are held in all schools. Along with cultural program an elocution speech will be given on account of Republic day. For this students have to prepare a good speech so that all the listeners or students may be impressed. Some of the useful speeches are given here under for download purpose. 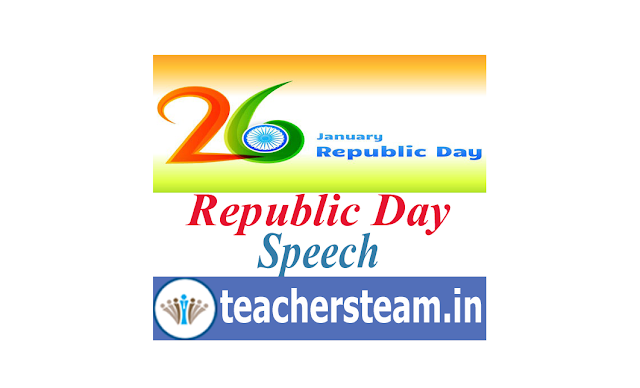 Students or Teachers can download the speech and prepare themselves to give effective speech on republic day.